Pure Water Gazette » Arsenic–Where Does It Come From? Arsenic–Where Does It Come From? Most arsenic enters water supplies either from natural deposits in the earth or from industrial and agricultural pollution. Arsenic is a natural element of the earth’s crust. It is used in industry and agriculture, and for other purposes. It also is a byproduct of copper smelting, mining and coal burning. U.S. industries release thousands of pounds of arsenic into the environment every year. 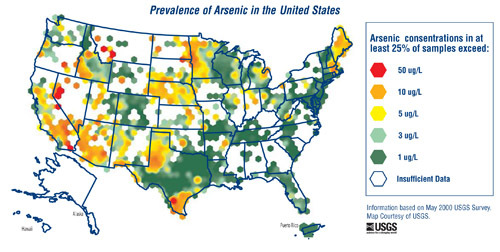 The map above from the US Geological Survey shows where arsenic is most prevalent in ground water. The EPA now considers arsenic a serious threat in concentrations as low as 10 parts per billion. The chart below shows the cancer risk assumption for drinking water with arsenic. Arsenic is most easily removed from drinking water with distillers, reverse osmosis, specialized filters, or anion exchange. Even common carbon filtration can remove a significant percentage of arsenic. More details about arsenic removal. Arsenic, it should be noted, is not entirely a water issue. A great deal of arsenic is present in foods and in common products like wood preservatives. Arsenic isn’t just found in water. 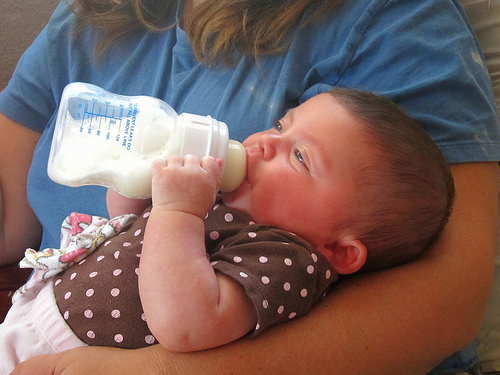 It appears in significant amounts in apple juice, sea foods, chicken, rice products (including rice syrups and cereal bars), wood preservatives, orange juice, and yes, even baby formula.